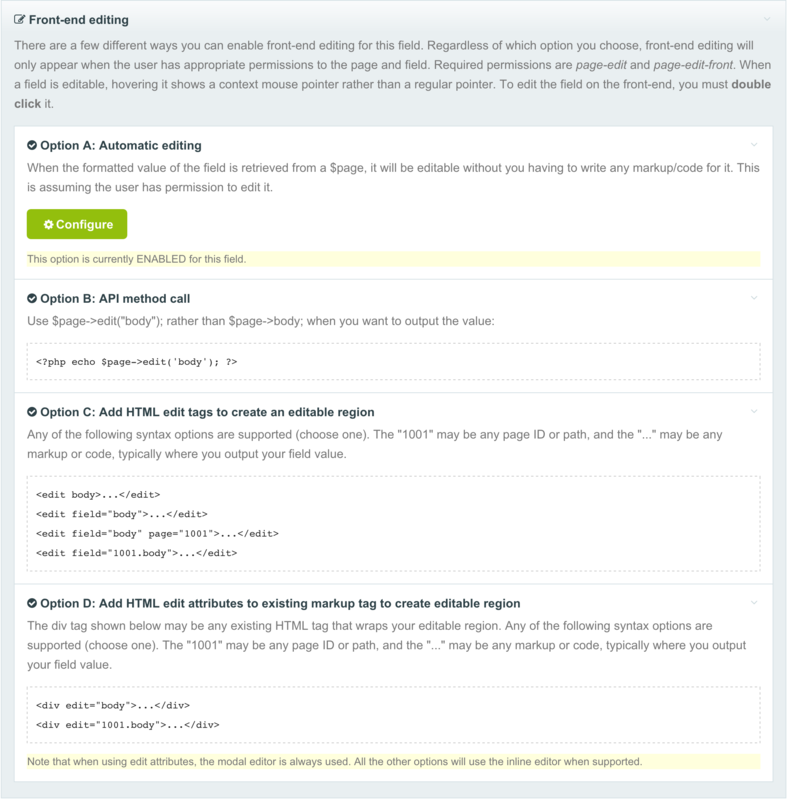 Last week we talked about the new front-end editing features coming in ProcessWire 3.0. This week we've got them now available for download and testing in version 3.0.1, aka alpha-4. We've also taken them quite a bit farther than what was introduced last week, and this post will be focused on covering all that you can do with it and how to use them. How do you enable front-end editing? In our post last week, we talked about how just text and rich text fields could be editable on the front end. But for those that really wanted to use front-end editing, I worried that might not be enough, and that we needed a more complete/overall ability to make any field editable on the front-end. 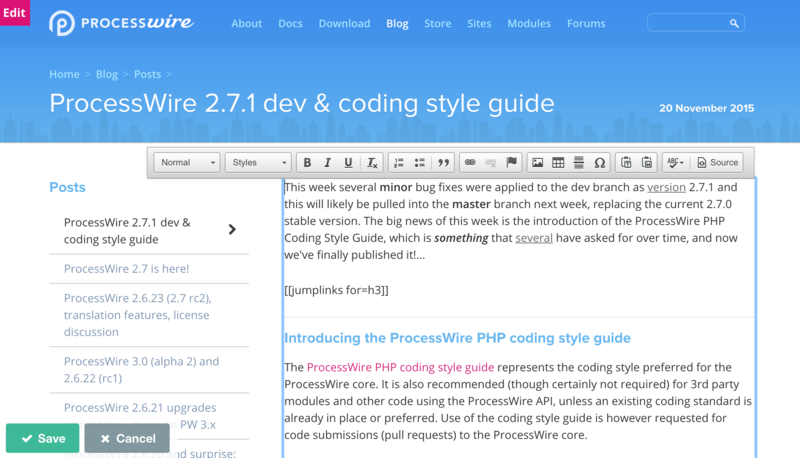 ProcessWire isn't a markup generator, and that's a great thing. It means you are in full control over the front-end of your site. But since ProcessWire doesn't control the front-end, there are very few assumptions that can be made from an editing perspective. Given that, making everything editable on the front-end means putting the user in a partial editing environment while still keeping them on the front-end. Taking much inspiration from Antti Peisa's Fredi, this is exactly what ProcessWire now does when you are editing some non-text field. When you are editing a text-based field (like this one you are reading) the editor will be inline, directly in the page, like you saw last week. When editing some other type of field, whether it be an Page Reference, Image, PageTable, Repeater, or any complex type, ProcessWire opens a dialog on top of your front-end where you can make edits specific to that field. To make an edit to a field on the front-end, you just double-click it. You can identify editable regions because the mouse cursor changes to a context pointer rather than just a pointer. When you save, the window closes, and the page updates with the newly-edited content, with no reloading necessary. So we now have a much more full front-end editing capability built into PW 3.0 (relative to last week) that can cover any field. 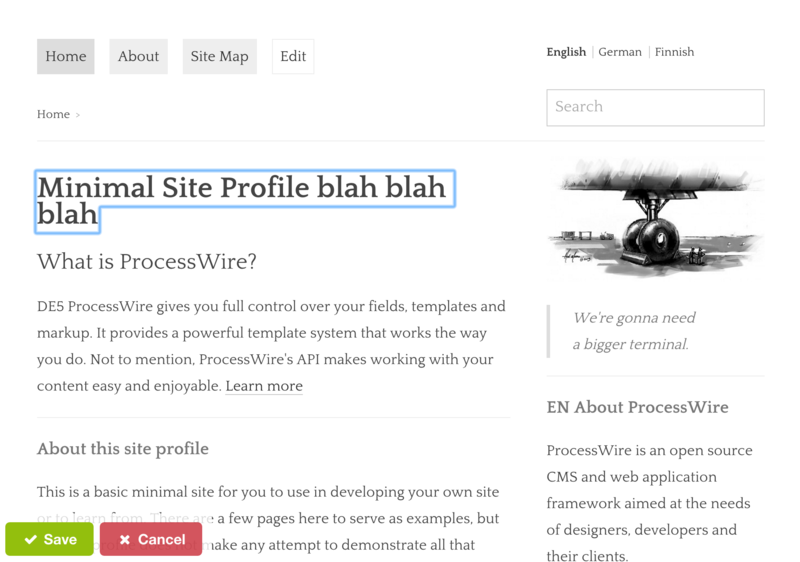 ProcessWire provides a few different options for you here, which we'll cover in detail below. Regardless of which option you choose, front-end editing will only appear when the user has appropriate permissions to the page and field. Required permissions are page-edit and page-edit-front. When a field is editable, hovering it shows a context mouse pointer rather than a regular pointer. To edit the field on the front-end, you must double click it. When the formatted value of the field is retrieved from a $page, it will be editable without you having to write any markup/code for it. This is a good option for fields like a "body" copy or "sidebar" field, that you might only output once on the page. The main benefit here is that you can make the field editable just by checking a box in the admin. It becomes editable wherever and however you are outputting it. It doesn't matter if it's coming from another page or not, as PW keeps track of it. ...but once you are having to do that, it kind of defeats the purpose of using option A, since you are now making API calls to support it. So you'd want to consider if one of the other options might suit your needs better in those situations. Note that $page can be any Page object, it doesn't necessarily have to be the current $page. This API method call option is good for fields that need no manipulation before output. Meaning, it's good for text fields, number fields, dates, and so on. But not worthwhile for things like Files/Images, PageTables, Repeaters or any field that you iterate to output or access object properties from. For those you will want to use <edit> tags or edit attributes, per options C and D.
The only difference from the above and what you may already be doing is just the addition of the surrounding <edit> tags. The point I'm trying to get across with the above is that it really doesn't matter what is in the editable region. Surrounding it with the <edit> tags means that double clicking it with open an editor to the "events" field. After saving your events field, the editor will close and that region on your page will be automatically updated with the new updated markup. The <edit> tags themselves never appear in the actual output of your site. They are stripped out during page rendering. If the user has no access to edit, then the edit tags are ignored and stripped out. If you are using <edit> tags with a field that supports inline editing (like a text or CKEditor field), the inline editor will be used. Otherwise it will open a dialog to the editor. These work about the same as <edit> tags except they are an attribute you can add to an existing tag in your markup, such as <div>, <span> or whatever you'd like. The "edit" attributes are stripped from the markup that gets output, so the only place you will see them is where you place them in your template file(s). Worth noting about option D is that it always uses the dialog editor and does not use the inline editor. All of the front-end editing features are provided by a module included with the ProcessWire 3.0 core called PageFrontEdit. Once this module is installed, you can use any of the above options. The module is not installed by default. Any time you edit a field in the admin (Setup > Fields) you'll see a "Front-end editing" section on the "Input" tab (at the bottom). If you don't have PageFrontEdit installed, it gives you a button you can click to automatically install it. When the module is installed, the "Front-end editing" section in your field editor shows you all of the options mentioned above but within the context of the field you are editing. If the field does not support one of the options, it is disabled in the copy/paste examples it gives you. By the way, the PageFrontEdit module has a configuration screen that lists all of the fields that you can enable for option A (automatic editing), with checkboxes for each to enable. These checkboxes are not applicable to options B through D mentioned above, just option A. Hope that you all enjoy these new front-end editing features and please let us know how they work for you. This is all brand new code to PW, so I'm sure we will still have some issues to work out. As a result (like the rest of PW 3.0) use this for testing, not production, and please let us know of any issues you come across. Remember to visit the ProcessWire Weekly this weekend! As always: This is great work! The only doubt I have is that it makes the frontend way more flexible than the backend considering e.g. the editing of associated pages (children, parents, page fields, ...), all on one screen. Wouldn't it be great if we could specify additional editable fields for purposes like this for backend editing in the templates? 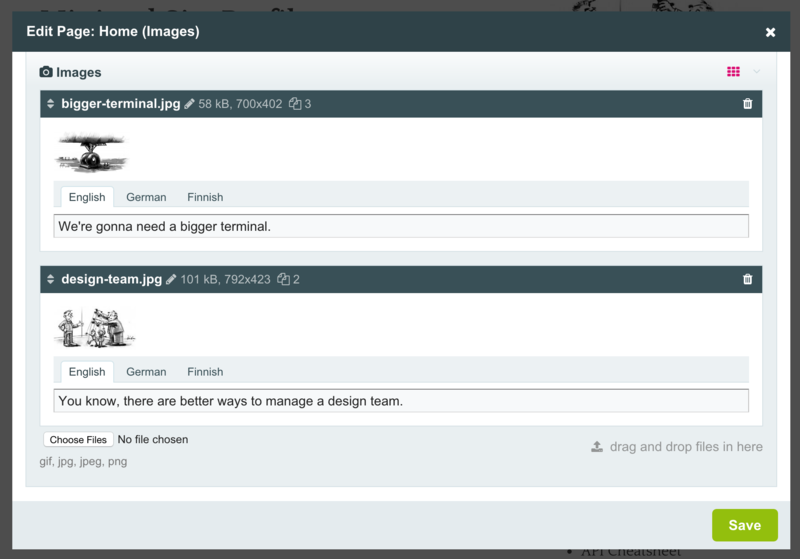 The front-end editing is a nice convenience no doubt, but flexible relative to the admin? I still think the dedicated admin environment is a lot more flexible for most editing purposes. Whereas the front-end editor is a nice front-end support to the existing admin tools. It is true though that if you had a need to setup a place where you could edit a whole bunch of pages on one screen, you could set that up pretty easily on the front-end, so there are definitely some interesting possibilities there. Nikoloas - you can actually do some pretty cool things along that line with kongondo's RuntimeMarkup module (http://modules.processwire.com/modules/fieldtype-runtime-markup/). I have used it for creating a modal edit link to content from another page. Strong warning about title field might be enough. Will do a manual install to test this release. Mike, not sure about those messages. Are they coming from the ProcessWireUpgrade module? For this devns branch, I'd suggest updating manually by replacing your /wire/ and /index.php files (renaming the old ones) so that you can switch between 2.x and 3.x as needed. Also this is the alpha-4 version (not alpha-3), which is also called 3.0.1. The alpha-3 version did not include any front-end editing tools. This looks great. Do you have any plans to extend this for front-end page creation? By that I mean allowing us to set up fields in the back-end and then allowing users to easily create new pages via the front-end with our own desired markup and the benefit of PW's security? I see the front-end editor as a support to the admin rather than a replacement of it. No doubt we'll continue building upon what we've got though, but when it comes to actual management of pages, that's what the admin is all about. Fantastic implementation, works great here! Not sure about the automatic mode A - had expected problems with head title element, but also form elements etc. Maybe a possible support nightmare and confusion point, hard to tell. Option A is useful for things like a body copy field, sidebar, or anything you output once on the page. But not so useful for something like a title field, where you are re-using it for different purposes in multiple parts of the page (like navigation, browser title, breadcrumbs, etc.). In order to reduce confusion, I may just remove "title" from being selectable for option A, or at least put a strong warning about it. Though option B or C would be ideal for a title field. Works nice so far, especially like popup with multiple fields! Great work! Would be amazing to be able to change to single click. This module is perfect, but the edit toolbar doesn't always show up. Chrome seems to work most reliably. In Firefox and IE/Edge I only get the save/cancel button and then when you try to save changes an error message pops up: 'no changes to save'. Has anyone else seen this? Maybe a js/jquery conflict? Apologies if I had already posted this. I think I posted on an earlier version of this module? Hello. I am testing the new frontend editing for an image field after adding the edit tag to an and it shows the popup window but after a second closes itself. I checked tried other methods and still have the same result. No errors in the log and I am logged on as a Super User.